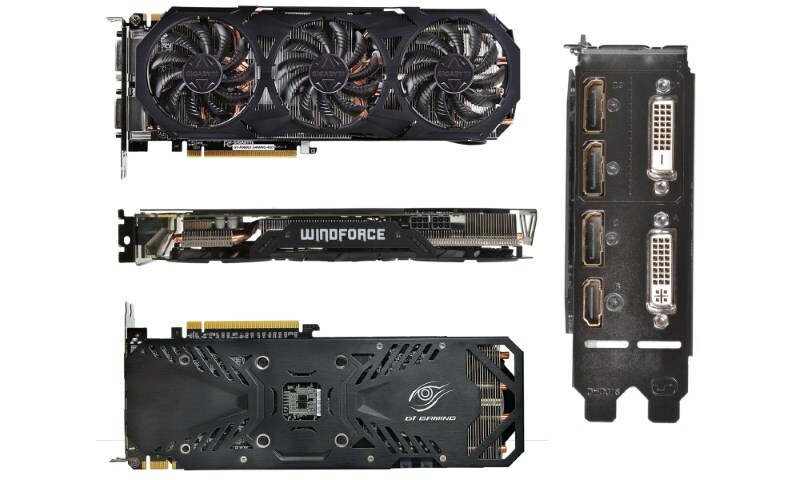 As you might have heard, manufacturers everywhere have starting to roll out the new 4GB version of the NVIDIA GeForce GTX 960 graphics card into the market. 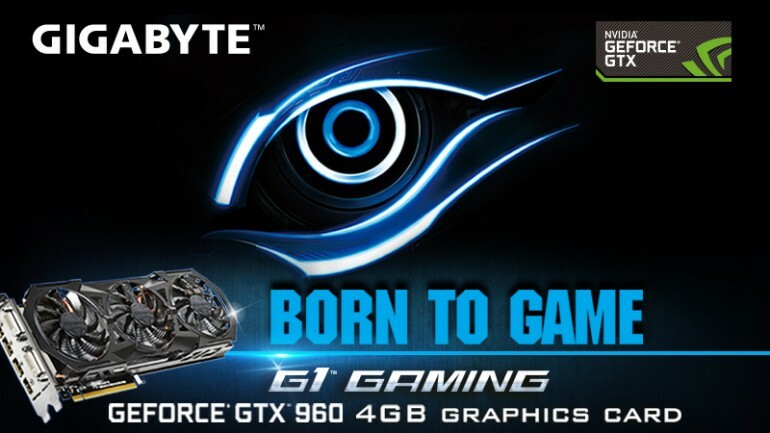 GIGABYTE is one such manufacturer and has unveiled two versions of the card including this particular G1 Gaming model that features the company’s own Windforce 3X cooling system. While we will be discussing about the new variant of GTX 960 soon, here’s a good news for you: we have three units of the GIGABYTE GeForce GTX 960 4GB G1 Gaming graphics card to be given away! Before we start, let’s take a brief look at the new GIGABYTE GeForce GTX 960 4GB G1 Gaming graphics card. Featuring 1024 CUDA cores and comes pre-overclocked directly from the factory, the graphics card operates at two different set of GPU clock speed: 1241MHz (base clock) / 1304MHz (boost clock) in Gaming Mode and 1266MHz / 1329MHz in OC Mode. Designed by GIGABYTE itself, the Windforce 3X thermal solution combines together three fans and copper heat-pipes to help dissipate heat from the graphics card. Additionally, it is also equipped with an indicator that would light up to notify users that the card has switched to silent mode with all of its fans turned off. This particular operation mode happens automatically when the card’s temperature is deemed to be low enough. Another in-house technology that the GIGABYTE GeForce GTX 960 4GB G1 Gaming graphics card offers is the GIGABYTE Flex display technology which helps the card deliver multi-display gaming experience as it automatically detects up to four monitors at a time. Not to forget, this card is also made using components that are part of the company’s Ultra Durable VGA standards which promises lower GPU temperature, better overclocking capability, and a decrease in power switching loss. 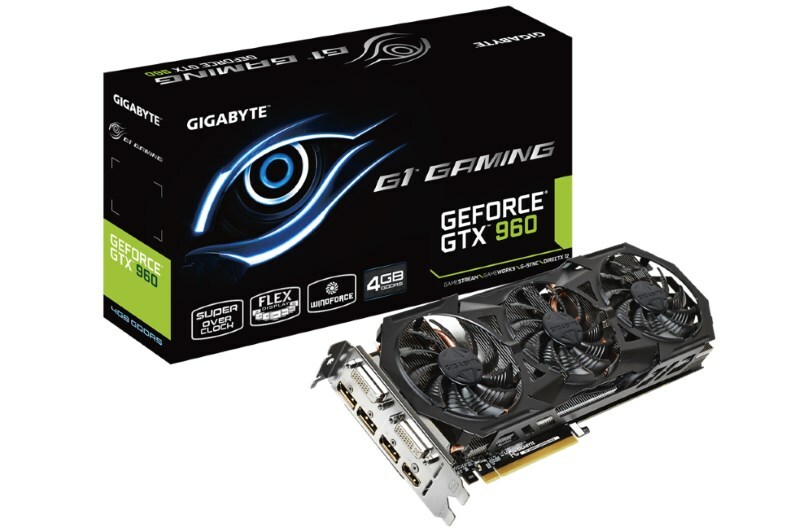 Why do you want the GIGABYTE GeForce GTX 960 4GB G1 Gaming graphics card? 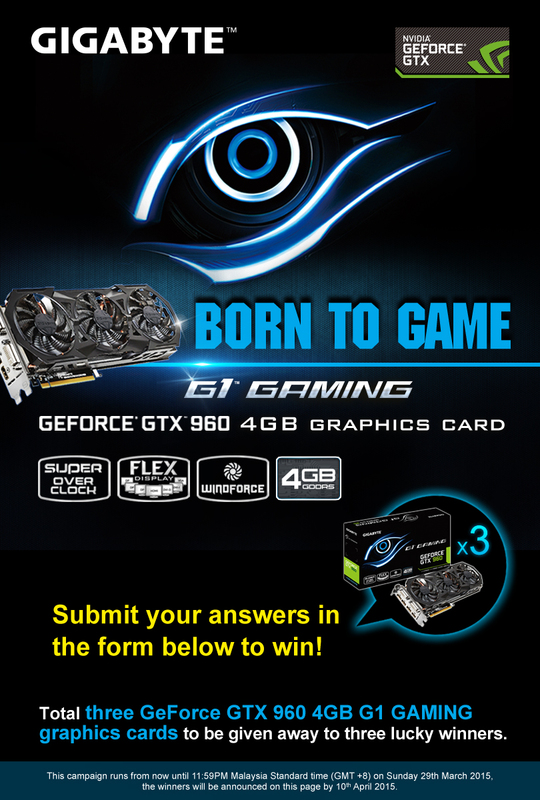 Which feature within the GIGABYTE GeForce GTX 960 4GB G1 Gaming graphics card do you like the most? With three units to be won, you have from now till 29 March 2015 to submit yours answers. Open only to Malaysians residing in Malaysia, check out the full terms of conditions for this giveaways within the submission form right below before submitting your answers in the form itself. Entries submitted in the comments section will not be entertained – we won’t be able to contact you without your particulars! Good luck to all that are participating in this giveaway!